Marcos Rivera had three hits in Friday night's win. BELOIT, WI (April 12, 2019) - A three-run ninth inning rally by the Clinton LumberKings was enough to overcome a late charge by the Beloit Snappers in an 8-6 win on Friday night in Beloit. Jerar Encarnacion and Marcos Rivera led the charge for Clinton (3-5) with three hits apiece in a nine-hit night at the plate. Beloit (4-5) jumped out to an early 3-0 lead against LumberKings starter George Soriano. The Snappers scored a run in each of the first three innings and chased Soriano from the game after just 2.1 innings of work. Clinton meanwhile failed to get much going through the first three frames. Snappers starter Aiden McIntyre retired the first eight batters he faced - the first five with strikeouts - but ended his night with a no decision after allowing his only run of the night in the fourth inning. 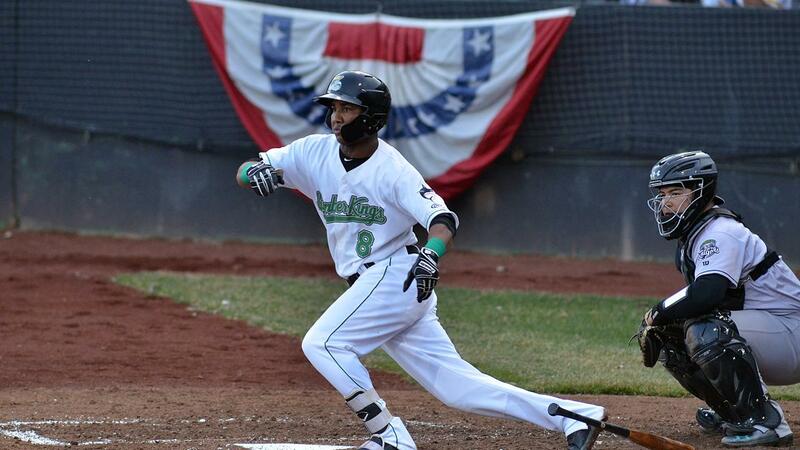 The LumberKings offense finally broke out in the top of the fifth for the first of two three-run rallies on the night. Encarnacion plated the first run with a double to left, J.D. Osborne tied the game at three with an RBI single, and Demetrius Sims put Clinton in front with a sacrifice fly to center. In the top of the seventh, Clinton added to their lead with a Connor Scott bases loaded walk that made it 5-3. Beloit then rallied in the bottom of the eighth after failing to register a hit from the third inning through the seventh. Eight men came to the plate in the inning as they scored three times against reliver C.J. Carter (1-1) to take a 6-5 lead. The LumberKings returned the favor in the top of the ninth with a three-run rally of their own - their second of the night. Christopher Torres tied the game with a sacrifice fly off Calvin Coker and Jerar Encarnacion added his second RBI double of the night to put Clinton on top for good. Steven Farnworth worked the ninth for Clinton and earned the save working around the LumberKings fifth errors of the night. The LumberKings will meet the Beloit Snappers for game two of their three-game series on Saturday night. Clinton will throw right-handed pitcher Peyton Culbertson (0-0, 1.59) while Beloit will counter with righty Reid Birlingmair (0-0, 4.91). Fans looking to listen to the game can hear Erik Oas on the call online at lumberkings.com via the tunein radio ap at 3:45 p.m. with the pregame show.